Better Beaches OBX is looking for help transporting Christmas trees for use to help stabilize sand along the shore. Boy Scout Troop 117 as well as many local residents have given the group more than 150 trees so far. 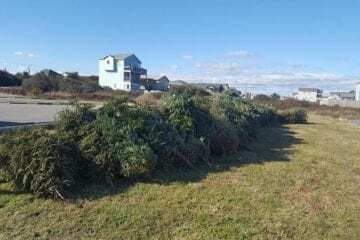 Ocean Boulevard Bistro & Martini Bar and The Islander Motel at Nags Head will continue collecting them through January. “Since we are still expecting a lot, we could use some help transporting them to the beach if anyone is interested – probably a half hour to an hour a day since it takes some muscles – and on decent weather days,” the group said in a Facebook post. A large load from Virginia may also be on the way in the next few weeks. Anyone who wants trees for beach stabilization on their property should contact Better Beaches for details. Group members will go over how to anchor them, and in which strategic spots, so they do not blow around or wash out too soon. For more information, visit betterbeachesobx.org.